A return visit by Daniel John Martin guarantees a Hot Club-plus occasion with the emphasis very much on the 'plus' element. To describe DJM as a virtuoso performer is like calling Lionel Messi a half-decent footballer. 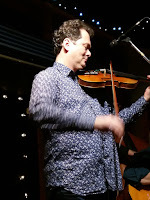 It is all but impossible to convey to those who've yet to hear the Paris-based violinist at a gig just how good he is. This Black Swan engagement, the second of five in the north east, attracted a number of new faces - little did they know what a treat lay in store! The Anniversary Song (aka Waves of the Danube) opened the show, and it was a 'show' in the best sense of the word. The virtuosity almost casual, DJM clearly enjoys working with Swing Manouche. Mick Shoulder's outfit, now with a settled line-up, ensured that it was up to the mark with all bringing their A-game to the party. She hates California opined DJM, and so we got it - The Lady is a Tramp, that is - every bit as nonchalantly as Bobby Darin or any Rat Pack associate. Rhythm king Giles Strong occasionally stepped up to take a solo - construction, technique, the whole package - none more so than on Tenderly. Bandleader Mick Shoulder literally shed blood. Four dropped picks during the evening failed to stop him in his tracks as he played on with bloodied fingers - a case of suffering for one's art! From time to time DJM sat on a high stool content to let Swing Manouche do its/their thing. Bassist Paul Grainger was on top form throughout taking a couple of solos along the way including a sterling effort on Oriental Shuffle. The first set concluded with I Wish You Love. DJM's vocals are extraordinary. A 'light bulb' moment occurred during the second set as Swing Manouche's guest from Paris sang with such authority one could have been forgiven for thinking 'Ian Shaw'. Yes, that's who he reminds one of! Cue There Will Never be Another You. In introducing Mick Shoulder's Cigano Bolero DJM stated that it was a wonderful tune - high praise indeed! And, having heard the number on several occasions, it can be said that it is canny good. Lady be Good produced more fireworks, an audience request for Autumn Leaves heard DJM in full voice, pizzicato strings and voice topped-off by a sublime solo from Giles Strong. And that was it, except DJM wandered into the audience to share a song with a redhead from the local scene by way of Eastern Europe with Messrs Shoulder, Strong and Grainger following in his wake. Were we in Rue de la Huchette? We could have been but this was the Black Swan, Rue de la Westgate Road! 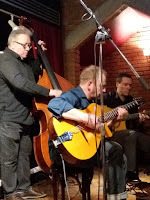 It had been a wonderful evening of top class jazz. 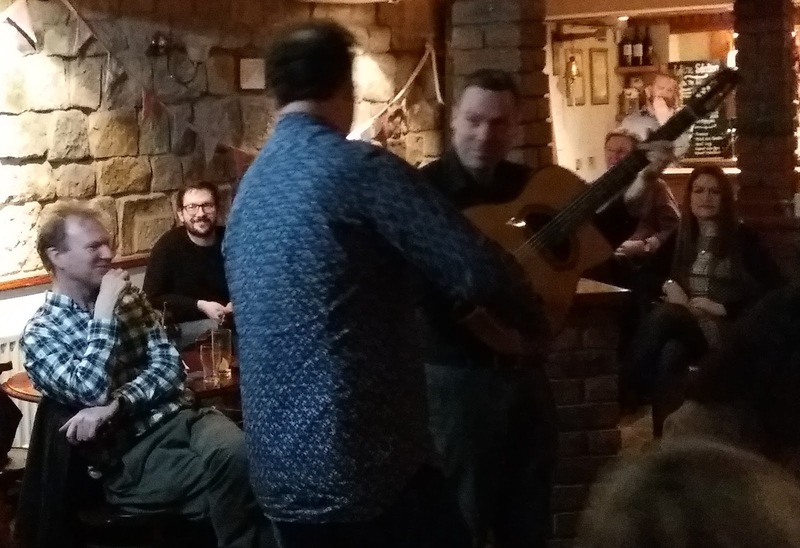 You have three further opportunities to catch up with Daniel John Martin - tonight (Friday) Swing Manouche will be at the Rabbit Hole, Durham (diners only), tomorrow evening in Hexham (The Vault) and on Sunday afternoon at Claypath Deli, Durham. Apparently you were the man sitting in front right next to me! Thank you also for sharing your interest in jazz music so that others may eventually decide to go out one night and discover what drives our passion for this music. Unsure times may lay ahead of us but as long as there are people like you to help others discover a new love for art whatever form it may take... there's some hope! Salut l'ami et à bientôt.